Bergstrasse Bike Books from Omnimap. Welcome to Omnimap's Bergstrasse Bike Books web page. This small publisher produces six excellent cycle touring guides about cycling in Germany and Switzerland, with short excursions into Austria, France, Italy and the Netherlands. Bergstrasse, a husband-wife team, started their operation largely because when the male half of the organisation came to Germany about 30 years ago, he fell in with a group of cyclists. He started cycling again after a break of about 20 years and enjoyed it. The female half of the organisation on hearing that he had taken up this activity, decided that he had a death wish, but was persuaded to try touring when they finally got married and she came to Germany. Their first major tour on a fairly new seven-gear touring bike and a three-speed mail order clunker was along the Danube from its source to Vienna. They made it in spite of dreadful weather at the start and a stomach disorder at the end. They then started to look farther afield and discovered that there were few books in English about cycling in Germany. They also found that some of the German cycle guides appear to have been written using a car for major portions of the trip. They thought this was a bit off (more than a bit, actually) and that there was room in the world for cycle guides researched on bicycles. At the time both of them were working in scientific publishing and had found out a bit about book publishing. Over a couple of years they chatted to various souls in the publishing business about a series of cycle touring guides. There was absolutely no interest, so they decided to publish them ourselves. The six guides listed below are the results; all written from riding the routes on bikes. For more information on the Bergstrasse Bike Book duo, or links to hotels in Germany, a European cycling blog, etc., go to their web site at www.bergstrassebikebooks.com. Rhine End-to-End. Part I: Andermatt to Basel. Bergstrasse Bike Books. 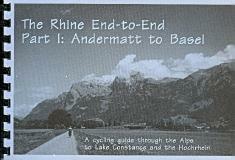 “The Rhine End to End part 1: Andermatt to Basel” starts in Andermatt in the Swiss Alps and on the first day there is a pass climb of 600 m over 10 km, after that the road drops or is basically flat down to Basel. You can take a train to just below the top of the pass. The route leads you to Disentis with its monastery, Chur, Leichtenstein, Lake Constance, Kaiseraugst with its well excavated and restored Roman settlement to finish in Basel. The cycle touring guide includes information on back up public transport, accommodation, food and drink, travel to the starting point, how to cope with emergencies, the basic rules of the road, equipment and packing, recommended maps and a 60 page route description with sketch maps. A series of appendices include an English-German cycling glossary, hotels, guesthouses, B&Bs, Youth Hostels, camp sites and bike shops. Don't forget volume 2, Basel to Hook of Holland, listed below. Rhine End-to-End. 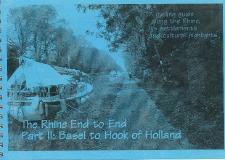 Part II: Basel to Hook of Holland. Bergstrasse Bike Books. “The Rhine End to End part 2: Basel to Rotterdam” starts in Basel and follows basically the left bank of the Rhine through Strasbourg, Karlsruhe, Speyer, Mannheim, Heidelberg, Worms, Mainz, the Rhine Gorge, Koblenz, Bonn, Cologne, Düssseldorf, Nijmegen, Rotterdam to the Hook of Holland. 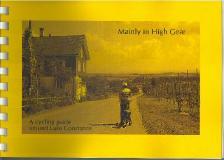 The book includes information on back up public transport, the castles on the Rhine, accommodation, food and drink, travel to the starting point, how to cope with emergencies, the basic rules of the road, equipment and packing, recommended maps and a 90 page route description with sketch maps. A series of appendices include an English-Dutch-French-German cycling glossary, hotels, guesthouses, B&Bs, Youth Hostels, camp sites and bike shops. This self-published guide, written by a retired couple of cycling enthusiasts who rode the entire route, is a superb English-language guide to this very popular route. Don't forget the first volume that covers from Andermatt to Basel. Cycling the Riesling Route. Bergstrasse Bike Books. 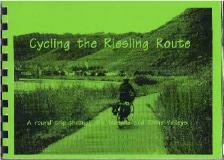 “Cycling the Riesling Route” is a description of an 800km circular route through western Germany and eastern France. The route goes down the Rhine from Strasbourg, up the Moselle to Nancy, and along the Canal de la Marne au Rhin to Strasbourg. The description starts in Mainz, but a trip can be started anywhere along the route. The cycle touring guide includes information on back up public transport, accommodation, food and drink, travel to the starting point, how to cope with emergencies, the basic rules of the road, equipment and packing, recommended maps and a 50-page route description with sketch maps. A series of appendices include an English-German cycling glossary, hotels, guesthouses, B&Bs, Youth Hostels, camp sites and bike shops. 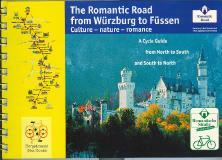 The Romantic Road from Würzburg to Füssen. Bergstrasse Bike Books. Planning a trip along this route is not easy. You are spoilt for choice. During the trip you can visit a uniquely massive meteor crater, two UNESCO World heritage sites, two of the most popular tourist sites in Germany, three walled mediaeval towns, five castles, five chateaux, a concert at a music festival, forty or so museums and more former Free Imperial Cities than you can shake a stick at. You can savour fine wines; eat carp, grünkern and emmer; drink emmer or wheat beer, contemplate the colour of a fine dark beer or even a second dark beer; swim or learn the secrets of summer tobogganing. All this in two weeks coupled with cycling 424 km and between 2300 and 2550 metres height difference. The book includes information on back up public transport, accommodation, food and drink, travel to the starting point, how to cope with emergencies, the basic rules of the road, equipment and packing, recommended maps and a route description with sketch maps. A series of appendices include an English-German cycling glossary, hotels, guesthouses, B&Bs, Youth Hostels, camp sites, bike shops and bike hire. Mainly in High Gear - A Cycling Guide Around Lake Constance. Bergstrasse Bike Books. Lake Constance is one of Germany's most popular cycling areas. This guide describes not only the lakeside path, but also gives a series of excursions into Thurgau in Switzerland, down to the Rhine Falls in Schaffhausen and up to historic Ravensburg. The book includes information on back up public transport, accommodation, food and drink, travel to the starting point, how to cope with emergencies, the basic rules of the road, equipment and packing, recommended maps and a route description with sketch maps. A series of appendices include an English-German cycling glossary, hotels, guesthouses, B&Bs, Youth Hostels, camp sites, farmhouses where you sleep in the barn, bike shops and bike hire. 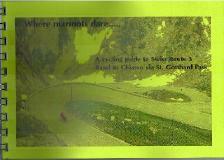 Where marmots dare... A cycling guide to Swiss Route 3 Basel to Chiasso via St. Gotthard Pass. Bergstrasse Bike Books. Swiss Route 3 runs from Basel to Luzern over the St Gotthard Pass to Bellinzona and Chiasso. With our Guide and the route planning we suggest, it is possible for anyone from 10 to 80 to cycle over the Alps with a judicial use of bus, ship and/or train. The book includes information on back up public transport, accommodation, food and drink, travel to the starting point, how to cope with emergencies, the basic rules of the road, equipment and packing, recommended maps and a route description with sketch maps. A series of appendices include an English-German cycling glossary, hotels, guesthouses, B&Bs, Youth Hostels, camp sites, farmhouses where you sleep in the barn, bike shops and bike hire.